Neighbors | Jessica Harker.Poland Union Elementary school's salt water aquarium sits in the school's library, currently housing 18 different types of fish. The tank uses an intricate filtration system, the majority of which was donated to the school from businesses across the nation. Neighbors | Jessica Harker.Poland Union Elementary school's aquarium sits in the school's library throughout the year, currently housing 18 different types of fish. Poland Union Elementary school recently released a live feed of their unique salt water aquarium on the schools website. Principal Mike Masucci said that this now allows anyone to go in and take a look at the range of fish and other aquatic life that has gained the school national recognition in the aquarium industry. Poland Union has had the salt water aquarium, which is housed in the school’s library, since 2015. The tank currently houses 18 different species of fish, along with coral and other aquatic life. “It’s been a lot of fun, and the kids really love it,” Masucci said. He has been taking care of the tank since it was installed, learning how to care for a salt water aquarium during the three years. “It has been a learning process, but I have some really great parents that like to come in and help me out,” Masucci said. One such parent is Dave Smith, who Masucci said comes to the school every Monday, donating his time to care for the animals. “He comes here and tests our water parameters to make sure they are perfect, yells at me for what I don’t do perfect. He cares,” Masucci said. He explained that Smith is involved in the hobby himself, and has a son attending kindergarten at Poland Union. Salt water tanks are an expensive hobby to keep up, Masucci said. He estimated that the schools current set up including the filtration system would cost around $19,000. A multitude of organizations across the country, after hearing about the elementary school’s tank, donated various fish, coral and even technology to help continue its operation. One such donation was a system which allows Masucci to monitor the tank from his smart phone, and even allows him to feed the fish remotely. “Over the summer in June I was in Jacksonville on the beach and I fed the fish,” he said. The Parent Teacher Organization each year delegates a portion of money that can be invested in the tank according to Masucci. 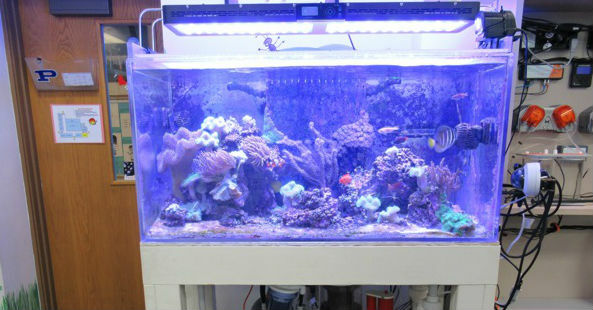 “This school year I have $800 to invest in that aquarium and I can use that money any way I want,” Masucci said, explaining that he plans to use the money to purchase new fish for the tank in November. To coincide with elections in November, students at the school will be voting on what fish they want added. Masucci said that not only has he found that integrating lessons into the school using that tank has been beneficial, but simply having it available has had a major impact on students. He said with the addition of the live feed, teachers are now able to pull up the aquarium on their smart boards, which has a soothing effect to students coming back from lunch or recess. Masucci said he also has students come into the library to feed the fish every day. “I really want to emphasize that those are living creatures that are dependent on us to feed them,” he said. Masucci said that his goal for this year is to acquire a new camera that will rotate through the tank, giving the live feed different angles throughout the day. “That’s not cheap, but you never know people are very generous,” he said. For more information about the animals living in the tank or to watch the live feed visit Poland Union’s web site at www.polandbulldogs.com/4/home. May 23, 2016 12:05 a.m.
February 5, 2016 12:01 a.m.